Rahshjeem Benson (left), Roza Novikov (center) and Giovannie Williams. Three people believed to be part of a larger criminal enterprise throughout New England were arrested by Kittery police Thursday after one of the suspects attempted to finalize a loan transaction with a false identity. 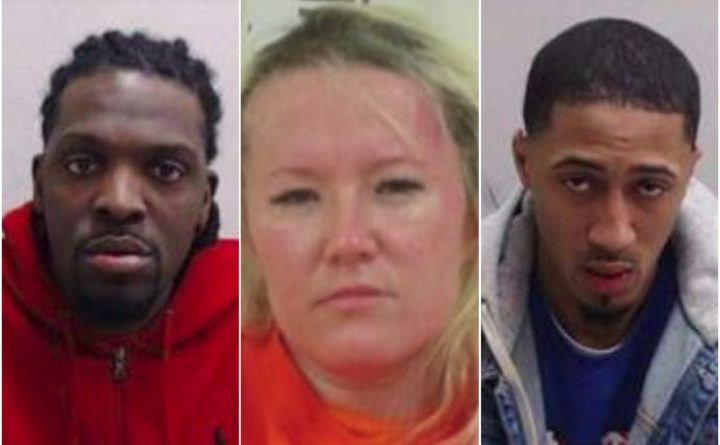 Arrested were Roza Novikov, 34, of Boston on charges of forgery and criminal attempt, and her two alleged accomplices, Rahshjeem Benson, 36, of Boston and Giovannie Williams, 30, of Dorchester, who were both charged with criminal attempt and criminal conspiracy. According to Kittery Police Chief Robert Richter, on Wednesday, police received information from Key Bank on Shapleigh Road regarding suspicious activity involving a woman attempting to secure a loan with questionable documents. Richter said officer Robert Byrnes responded to the bank and began an investigation. Through his investigation, Byrnes determined the suspect, later identified as Novikov, was not who she represented herself to be when she signed for the loans, Richter said. Subsequently, Novikov returned to Key Bank on Thursday to finalize the loan transaction. At that time, Byrnes responded to Key Bank along with Sgt. Gary Eaton, officers Jay Durgin and Tristan Valenti, and detective Brian Cummer. Through their investigation, the officers quickly determined the female suspect’s alleged criminal intent, as well as located and identified two male accomplices, who were waiting in a nearby parked vehicle. All three suspects were taken into custody. Richter said Novikov, Benson and Williams are believed to be part of a larger group committing similar crimes. Anyone with information on these three individuals is encouraged to call the Kittery Police Department at 207-439-1638.